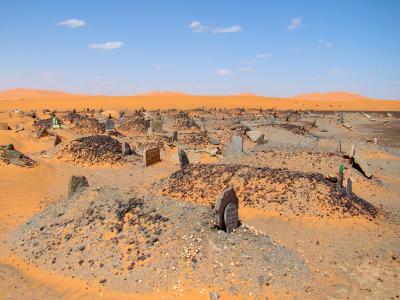 In the southeast region of Morocco is the small village of Merzouga. 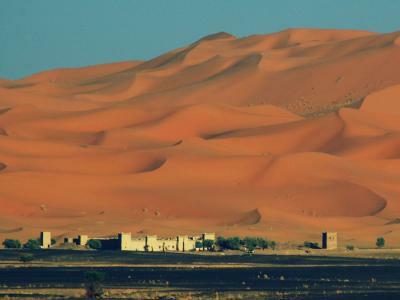 It is known for its closeness to Erg Chebbi, one of the two Saharan Ergs of the country. 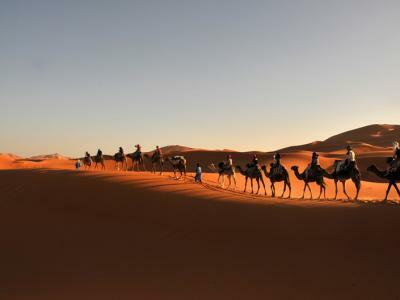 Many tourist visit Merzouga on their way to the sand dunes. Waking up to watch the sunrise over the sand dunes of Merzouga is a stunning experience. Some of the largest and highest sand dunes in Morocco can be found here. Merzouga also has the largest natural underground body of water in Morocco. During Spring, this lake comes to life and attract flocks of pink flamingos. Sights of other rare birds may be found here as well during the Spring migration. The desert is home to many mammals and reptiles. 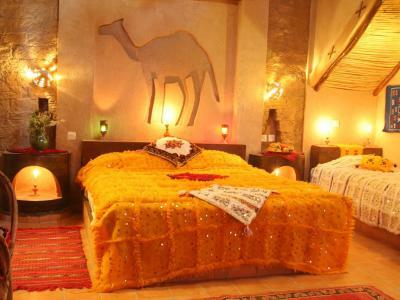 A camel trekking excursion through a sea of dunes will give you a good opportunity to see all of this.